Boozang can be run using the Chrome browser extension, which is a great way to get started. Sometimes it is desirable to run tests across different browsers, and support headless browser execution (see CI server integration on next page). 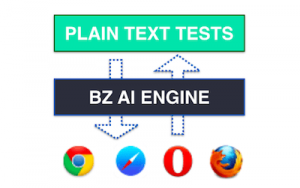 By downloading the Boozang html snippet for your project and deploying it in a public folder in your application, you can now launch the tool without the Chrome browser extension. This means you can now create and execute tests across any browsers. This also helps when onboarding new team members, as they no longer have to install the browser extension, or be bound to any particular web browser. Note: At the time of writing this document, all major browsers (Chrome, Firefox, Safari, Opera) were supported, but not Edge and IE. Microsoft has just announced that Edge will move over to the Chromium engine, meaning it will be supported soon.